BOSTON (AP) — Seven days after the Boston Marathon bombings, the city planned to mark the traumatic week with mournful silence and a return to its bustling commute. Massachusetts Gov. Deval Patrick has asked residents to observe a moment of silence at 2:50 p.m. Monday, the time the first of the two bombs exploded near the finish line. Bells will ring across the city and state after the minute-long tribute to the victims. Many Boston residents were heading back to workplaces and schools for the first time since a dramatic week came to an even more dramatic end. Traffic was building on major arteries into the city Monday morning. Authorities on Friday had made the unprecedented request that residents stay at home during the manhunt for suspect Dzhokhar Tsarnaev. He was discovered that evening hiding in a boat covered by a tarp in suburban Watertown. His older brother Tamerlan was earlier killed during a furious getaway attempt. In another sign of progress, city officials said they are beginning the process of reopening to the public the six-block site around the bombing that killed three people and wounded more than 180. The announcement came Sunday, a day when people could still watch investigators at the crime scene work in white jumpsuits. Tsarnaev remained hospitalized and unable to speak, with a gunshot wound to the throat. He was expected to be charged by federal authorities. The 19-year-old also is likely to face state charges in connection with the fatal shooting of MIT police officer Sean Collier in Cambridge, said Stephanie Guyotte, a spokeswoman for the Middlesex District Attorney’s office. A private funeral was scheduled Monday for Krystle Campbell, a 29-year-old restaurant worker killed in the blasts. A memorial service will be held that night at Boston University for 23-year-old Lu Lingzi, a graduate student from China. City churches on Sunday paused to mourn the dead as the city’s police commissioner said the two suspects had such a large cache of weapons that they were probably planning other attacks. After the two brothers engaged in a gun battle with police early Friday, authorities found many unexploded homemade bombs at the scene, along with more than 250 rounds of ammunition. On “Fox News Sunday,” he said authorities cannot be positive there are not more explosives somewhere that have not been found. But the people of Boston are safe, he insisted. Dzhokhar Tsarnaev and his 26-year-old brother, Tamerlan, the suspects in the twin bombings that killed three people and wounded more than 180, are ethnic Chechens from southern Russia. The motive for the bombings remained unclear. Sen. Dan Coats of Indiana, a member of the Senate Intelligence Committee, said the surviving brother’s throat wound raised questions about when he will be able to talk again, if ever. It was not clear whether Tsarnaev was shot by police or inflicted the wound himself. In the final standoff with police, shots were fired from the boat, but investigators have not determined where the gunfire was aimed, Davis said. In an interview with The Associated Press, the parents of Tamerlan Tsarnaev insisted Sunday that he came to Dagestan and Chechnya last year to visit relatives and had nothing to do with the militants operating in the volatile part of Russia. His father said he slept much of the time. A lawyer for Tamerlan Tsarnaev’s wife told the AP Sunday night that federal authorities have asked to speak with her, and that he is discussing with them how to proceed. Attorney Amato DeLuca said Katherine Russell Tsarnaev did not suspect her husband of anything, and that there was no reason for her to have suspected him. He said she had been working 70 to 80 hours, seven days a week, as a home health care aide. While she was at work, her husband cared for their toddler daughter, he said. The younger Tsarnaev could be charged any day. The most serious charge available to federal prosecutors would be the use of a weapon of mass destruction to kill people, which carries a possible death sentence. Massachusetts does not have the death penalty. Across the rattled streets of Boston, churches opened their doors to remember the dead and ease the grief of the living. At the Cathedral of the Holy Cross in South Boston, photographs of the three people killed in the attack and a Massachusetts Institute of Technology police officer slain Thursday were displayed on the altar, each face illuminated by a glowing white pillar candle. A six-block segment of Boylston Street, where the bombs were detonated, remained closed Sunday. But Mayor Thomas Menino said Sunday that once the scene is released by the FBI, the city will follow a five-step process, including environmental testing and a safety assessment of buildings. The exact timetable was uncertain. Boston’s historic Trinity Church could not host services Sunday because it was within the crime scene, but the congregation was invited to worship at the Temple Israel synagogue instead. The FBI allowed church officials a half-hour Saturday to go inside to gather the priests’ robes, the wine and bread for Sunday’s service. Near the crime scene, Dan and Keri Arone were pushing their 11-week-old daughter in a stroller when they stopped along Newbury Street, a block from the bombing site. 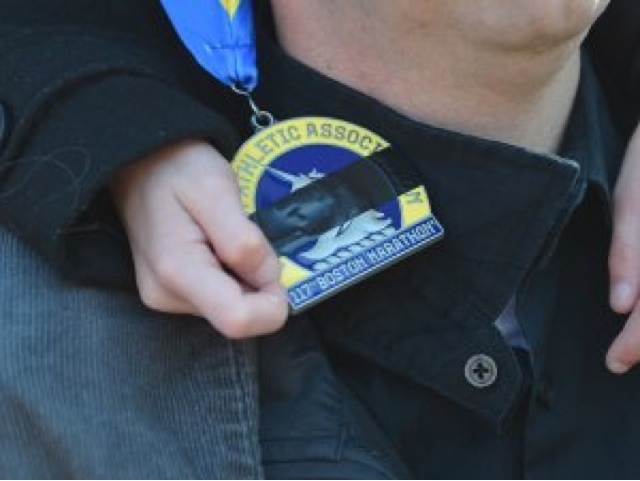 Wearing his bright blue marathon jacket, Dan Arone said he had crossed the finish line 40 minutes before the explosions. The Waltham, Mass., couple visited the area to leave behind pairs of their running shoes among the bouquets of flowers, hand-written signs and other gifts at a makeshift memorial on Boylston Street, near the police barriers. The federal Bureau of Alcohol, Tobacco, Firearms and Explosives was tracing the suspects’ weapons to try to determine how they were obtained. Neither of the brothers had permission to carry a gun. Cambridge Police Commissioner Robert Haas said it was unclear whether either of them ever applied for a gun permit, and the applications are not considered public records. But the younger brother would have been denied a permit based on his age alone. Only people 21 or older are allowed gun licenses in Massachusetts. Meanwhile, surgeons at a Cambridge hospital said the Boston transit police officer wounded in a shootout with the suspects had lost nearly all his blood, and his heart had stopped from a single gunshot wound that severed three major blood vessels in his right thigh. Richard Donohue, 33, was in critical but stable condition. He is sedated and on a breathing machine but opened his eyes, moved his hands and feet and squeezed his wife’s hand Sunday. Associated Press writer Meghan Barr and national reporter Allen G. Breed in Boston, and writer Michelle R. Smith in Providence, R.I., contributed to this report. HOLIDAY: Happy New Year 2013 to Southeast Asia! Brandon Lee in the TV show "Ohara"